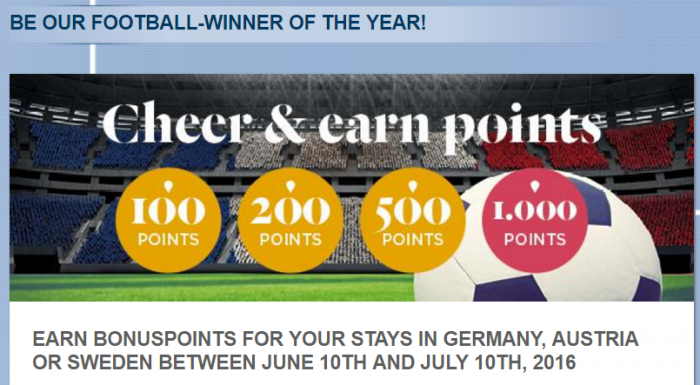 Le Club AccorHotels has launched a new bonus points promotion for stays in Germany, Austria and Sweden between June 10 – July 11, 2016. Members can earn 100 to 1,000 bonus points for up to two stays depending when consumed if booked June 1 – July 10. Note that you can earn the bonus maximum of two times. This must be football related promotion what I can tell from the photo used by Accor, although I have no idea (don’t really follow sports!). Good offer for those that will stay at any Accor hotels in these three countries during the offer period. I like the fact that you don’t have to book an inflated rate. The offer is available on all points qualifying rates. 1. General Le Club AccorHotels terms and conditions apply to the Stay & Earn up to 1.000 points! offer and you must be Le Club AccorHotels member to benefit from it. for a stay in one of the participating hotels in Le Club AccorHotels Loyalty program. The stays must be booked between 10/06 – 10/07/2016. The number of bonus points for this offer is calculated according to the points earned by the member based on Classic status. The date of check-in provides the basis for the number of bonus points credited. 3. This offer is valid for a member’s stay from 10/06 – 10/07/2016 in one of the participating hotels in Germany, Austria and Sweden, and booked between 01/06 – 10/07/2016. 5. Any consecutive stays (check-out and check-in same day) in the same hotel, will be considered as a single stay. This single stay will be eligible once to the Stay & Earn up to 1.000 points! Offer. You must register for the Stay & Earn up to 1.000 points! offer before proceeding to the booking, to be eligible to the offer. 12. Each member can benefit from this offer twice for stays between 10/06 – 09/07/2016.